I’ve just returned from DC after a week away–back to Wisconsin for Thanksgiving. Seeing my family again drove home just how much I missed them, but also how much I enjoy living on my own. It’s a balance between different sources of comfort and stress, I suppose, especially after as rough a year as this has been (you didn’t miss anything; I’m not giving details on this blog, at least for a while yet. Suffice to say this was the first time I’ve seen some people since certain things had happened, but the adjustment went far better than I feared). I also took a few days to run down to Chicago and hang out with my other family: the Whovians. 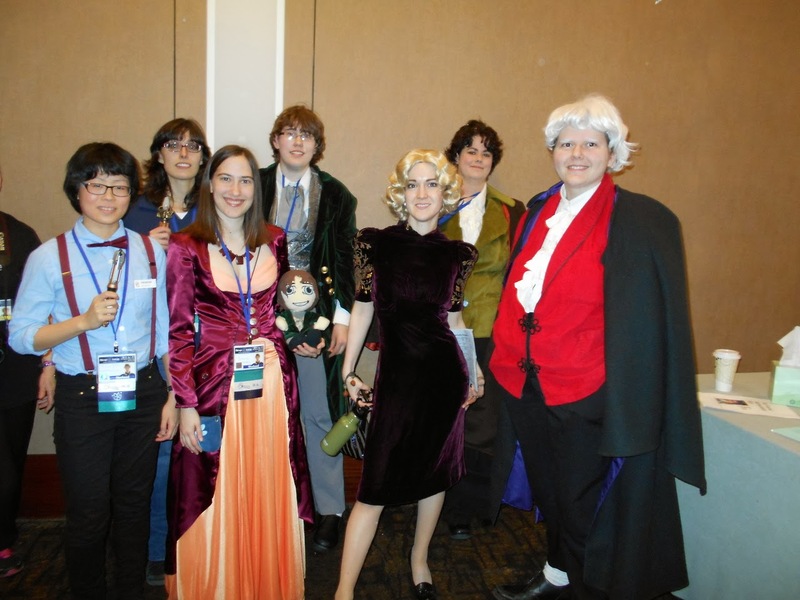 Pictured above: Ellen (as the Eleventh Doctor in the episode Closing Time), “Hearts” (as the Eighth Doctor in the Dark Eyes audios), me (as President Romana III), Fyodor (as the Eighth Doctor–and Plushie Eight), Ashli (as Charley Pollard from the Eighth Doctor audios), and 2 friendly Third Doctors whose names I didn’t catch. Photo credit goes to Fyodor’s mom! I just realized a lot of this post will not make much sense to anyone who doesn’t follow Doctor Who. Oh, well. Although I felt bad for running out on Mom for two and half days of the seven we had together, she was really sweet about agreeing to drive me to the convention center on a Black Friday. My sister, back from the University of Davis, rode along and we got two hours of conversation in that way. We’ve never been Black Friday shoppers (my sister and I have both worked retail) so it wasn’t a real loss to be driving that day, although we did worry about finding parking once we found out the convention was right near a shopping center. Luckily, we found spaces–among numerous cars in a certain shade of blue, licence plates like Davros and T4RDIS, and windows decorated in Circular Gallifreyan. We’d come to the right place. We’d hoped to get lunch between the three of us and “Hearts,” the first of the friends I was meeting at Chicago TARDIS, but the length of the registration line didn’t permit it, especially as Hearts & I wanted to make it to Paul McGann’s Q&A panel at 2 and it was already one o’clock. So I bid farewell to Mom and the sister, after explaining a few of the costumes they saw in the lobby (aw, civilians). 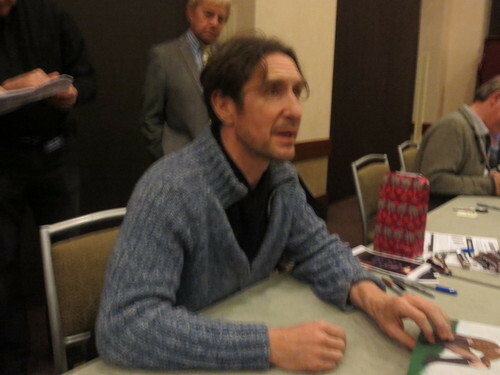 Anyway, although I’ve been participating in the Clann McGann since mid-2011, the first time I saw him in person was at Gallifrey One in 2012. 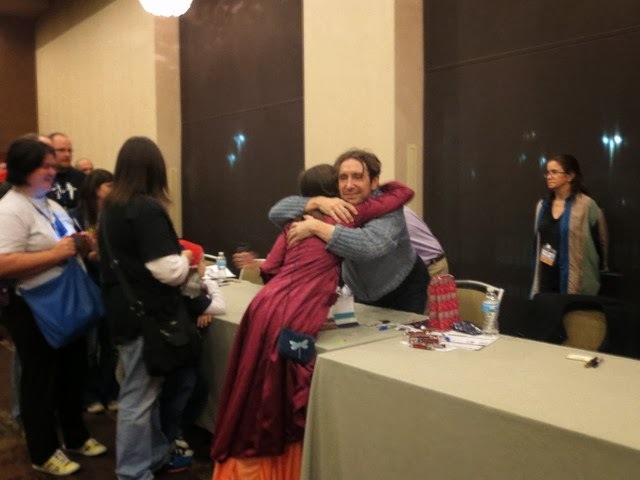 Long story short, Hearts and I had a singularly wonderful time, I wound up gushing and calling him “darling” to his face (a bit patronizing, as he’s 30 years older than I am) and over the course of apologizing for that, I wound up being kissed on the hand by the Eighth Doctor. Paul McGann is a wonderful human being. There was also one fan who was a bit nervous to ask his question. Paul told him to come onstage and see how nerve-wracking that was. So the intrepid fan lept up, turned around, let out a squeak like a gargantuan mouse, and jumped back down. I take it we were pretty intimidating. Speaking of politics, even the more liberal of us admitted to an uncanny feeling of deja vu as we found ourselves waiting…and waiting…and waiting…to see a doctor–for photos or autographs. The “virtual queue” ticket system is good in theory, but in practice–well, I’ll hold my peace, especially as I was lucky and got into all the sessions I hoped for. I feel very sorry for the volunteers who had to wrangle all of the crowds, very very sorry for crowd members who got lost in the shuffle, and pretty irritated, though not surprised, at how downright nasty some people are getting on the con’s Facebook page. Throwing insults around never makes anything better, you guys, for shame. I spent some time Friday in my Eighth Doctor cosplay, which has seen a lot of love over the years, but the heavy velvet coat and shirt which would not stay tucked (at least the waistcoat hid my duck tail) left me yearning for a change–plus, I wanted to show off my new discovery. While sorting through my wardrobe, I had discovered the makings of a “closet cosplay” of a native of Gallifrey, flaunting orange and magenta silk. 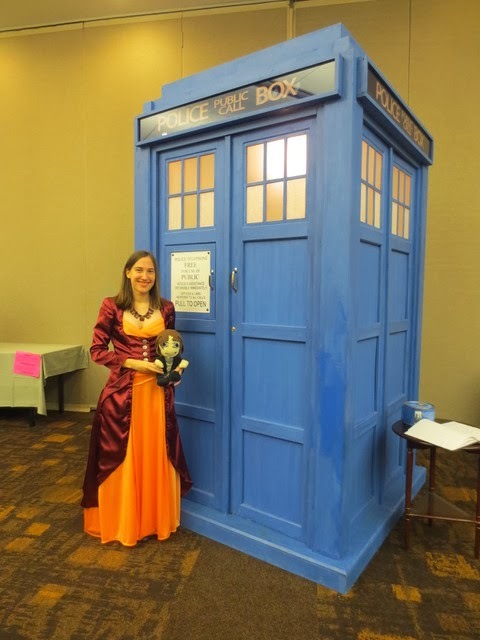 Although not everybody picked up that I was supposed to be Romana III (who only appears in the Eighth Doctor novels), I did get plenty of compliments, and several to the effect that they couldn’t believe it was something I’d dug out of my closet. 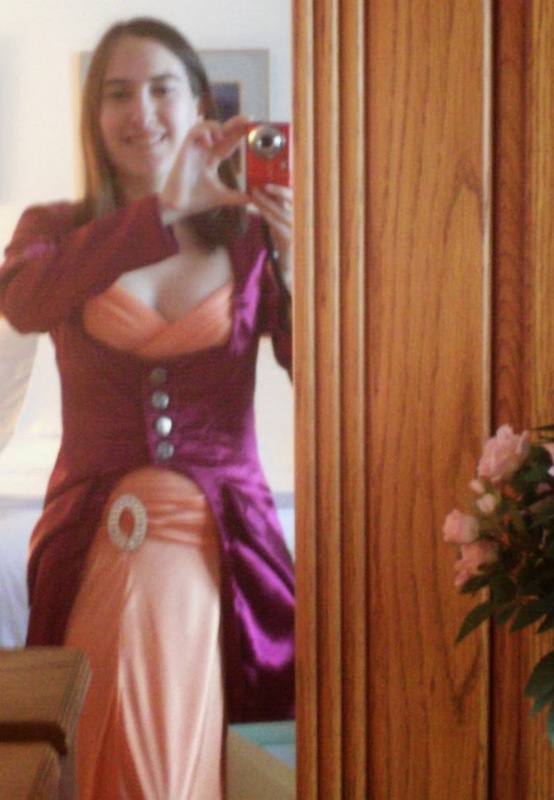 The secret ingredient to a closet cosplay: prom gown. Upon discovering a) that my prom dress was still wearable, plus the coat a good friend who works at JoAnn Fabrics had sewn me, b) in the 50th anniversary episode, some random Gallifreyans showed up in a similar color scheme, and c) this was really really fun to wear, I shared some pictures with my online Whovian friends asking them to convince me to do or not do it. They failed to convince me not to do it, so. This meant a number of people who had never before seen me in real life were able to recognize me by the dress, as I found out once I stepped off the elevator and had someone literally run across the lobby to greet me. Our merry band was rounded out as Heart’s (her preferred nom de guerre) and my friend Ellen arrived from Vancouver around 8 o’clock. We traversed the surrounding area in the chill November night to find a food court. Nourishment provided, we caught the tail end of the charity auction being held for the Illinois food bank and went to bed at an hour shockingly early for a con. “Hearts” is on the left, Ellen on the right. Ellen took many of these pictures, leading to the sadly ironic result that she does not appear in many of them. Then again, we were up shockingly early on Saturday morning. We wound up in the halls at 9:15, waiting to get in line for the virtual queue–or as I came to call the phenomenon, “queuing to queue for the queue.” The virtual queue system did not quite offer the unparalleled convenience it promised. 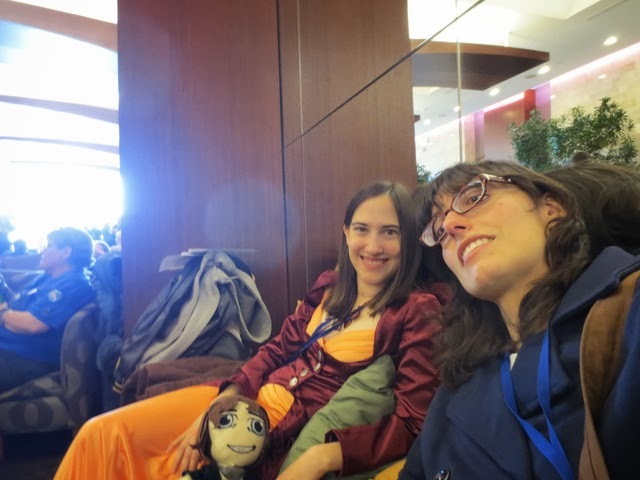 Milling around in the halls did give us the chance to meet with more Clann McGann members and other congoers, admire cosplays, and scout out the dealer’s room and upcoming panels. 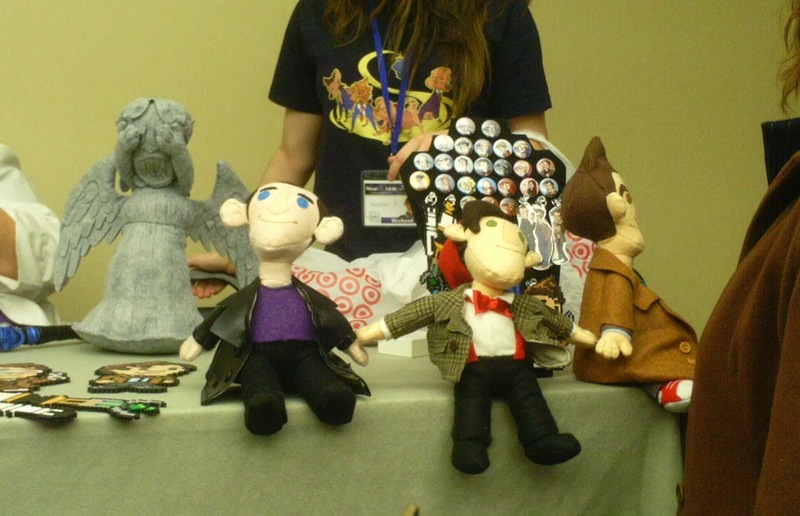 I am trying to convince Hearts (Plushie Eight’s mama) to sew more Plushie Doctors to sell in dealer’s rooms to come or perhaps on Etsy. Your help in this campaign is appreciated. Once I got my virtual queue ticket, I hurried to the 10:00 one-on-one session with authors Jonathan Blum and Kate Orman. This genuinely sweet married couple has written some of my favorite Eighth Doctor novels, so I rushed in as soon as possible in case I’d be crowded out by other fans. When I told this to Blum, he was genuinely appreciative. As were the 2 or 3 other people in the room. A few more did trickle in over the course of the hour, but I guess it is difficult to get people into Saturday morning panels. Even though plenty of us were up anyway thanks to the queueing. It was a really fun panel, although small. 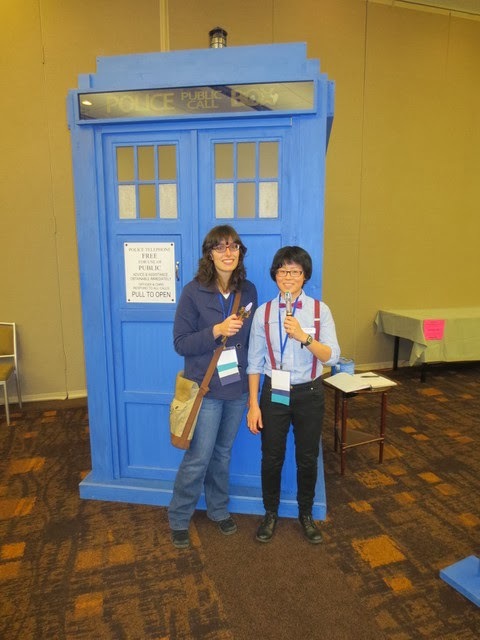 Orman and Blum compared their different writing styles–going really fast and then revising vs going slowly to create a more polished, if not finalized, first draft–and also reminisced on the “wilderness years” when Doctor Who as a TV show was over and the novels were the focus of fan attention. Not all of that attention was exactly good, as Blum recalls a fan standing up to demand a refund at an early convention. None of that happened here. 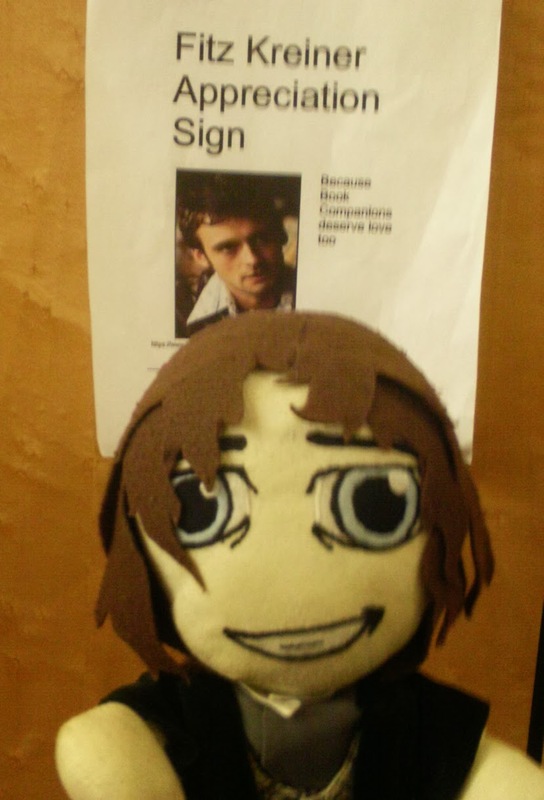 Also, one sure way to my heart is to admire Plushie Eight, which Blum and Orman certainly did. He was dubbed “insanely cute,” his little cravat was wondered over, and we discussed whether the Eighth Doctor’s coat was really green. The latest word I’ve had, from people who have seen the original in the autograph room, is that it was deep green, but the stunt coat was black and shimmered green in some lighting. The novels also described Eight’s coats as brown, purple, or red. Kate Orman related a brief-lived controversy over the color of Paul McGann’s eyes, which was settled by an editor spending an hour seated across from him and emerging to declare “They are BLUE.” A sentiment with which I heartily agree. And at some point over the course of the panel, despite a wise policy of not speaking ill of other writers, somebody mentioned writing needlessly overcomplicated plots and someone in the room (naming no names) cheerfully exclaimed, “Hello, Stephen!” Although I’m actually happy with what Moffat did for the 50th anniversary and extremely excited about him bringing McGann back for a mini episode, I’m very annoyed that the message he drew from the fan response to that episode was not “The fans really like the Eighth Doctor” but “The fans really like surprises.” To be fair, I think he may have been attempting to drive home a lesson about leaked footage–since that’s why McGann’s Doctor wound up regenerating a week early (“I can’t believe Moffat killed Paul on his birthday,” someone said in the Clann)–but, still. To a man with a hammer, nails everywhere, etc etc. Anyway, moral of the story is, the authors and stories of the Doctor Who books are awesome even if they’re no longer the Where It’s At of Who. 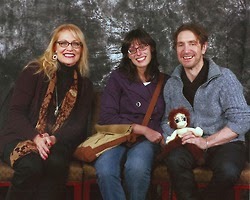 At last, Hearts, Ellen, and I found ourselves in the less-than-virtual queue for photos with McGann and Daphne Ashbrook–accompanied by some props. 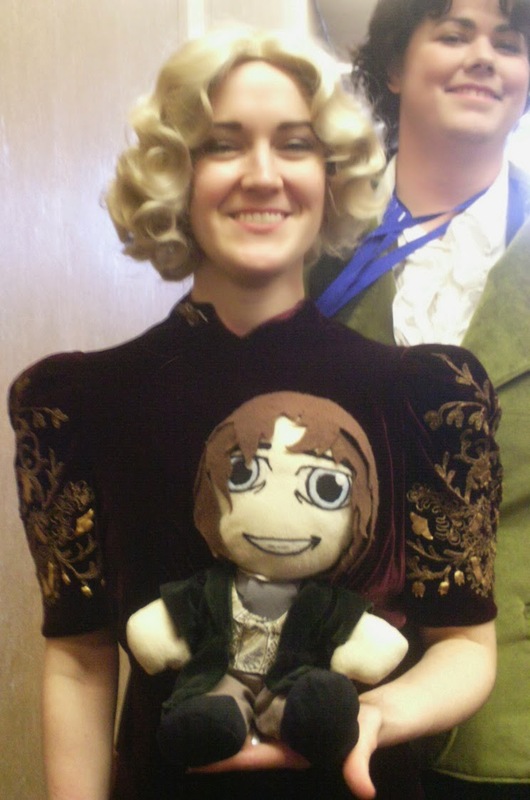 Ever since the “Paul Doll” got cuddled by Daphne at Gallifrey One this February, it has been my ambition to introduce him to the original. Now I had my chance. 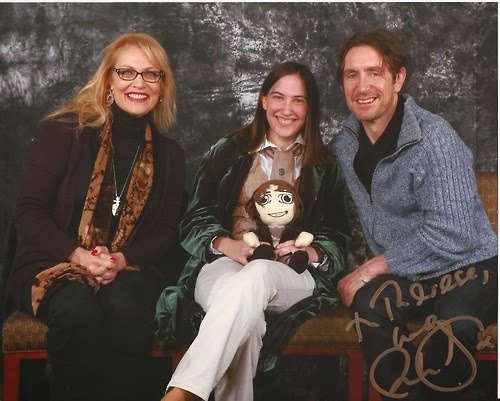 I was so flustered to see McGann in person again that I forgot to hand over Plushie for possible hugs or silly poses, an oversight I regret now. I did make Plushie wave (it’s not that I revert to 12 years old when shy; I genuinely just make plush toys wave at other people to say hello and I will do this all my life even if I die at 300 after a cyrogenic freeze). McGann said something about him being “Cute” and “like a little brother” but then he had his arm very firmly around my back for the photo and I wasn’t paying much attention. Paul McGann’s capacity for touchy-feelyness in a way that seems both friendly and sincere is a true gift. Then it was Heart’s & Ellen’s turn for a picture. I admit I watched with some trepidation, as their choice of props to pose with was…a little atypical. 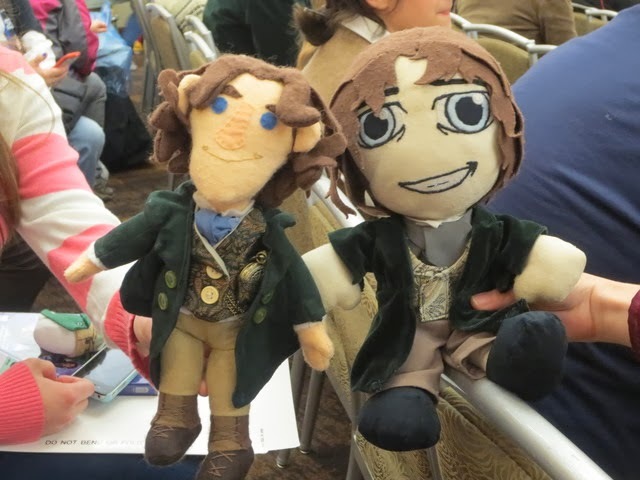 After sewing Eight for me, Hearts went on to make two other plushies–a little Redcoat and “the Kid,” a little faun. The faun was inspired in part by a scene of McGann’s in the early 90’s miniseries Nice Town. How shall I explain Nice Town? It’s an…erm, a comedy about family planning and gender roles in suburban Britain. It avoids being raunchy simply by how bizarre and at times straight-faced it is. That said, [please if you are under 16 can you stop reading this now] the little plushie faun was not…100% anatomically accurate in a way true to the film, which was very true to certain aspects of satyr mythology. So you have to admit that’s an unusual choice of plush toy (much as I love The Kid in his innocently magical way) and even more unusual to actually confront the actor with. I put our chances at 60-40 of Paul McGann taking out a restraining order on us on the spot. That’s probably why I made Hearts let me get my picture with him first. Scroll back up to that picture of Paul McGann to see his eyebrows, and consider how expressive they can be. “He’s missing a vital appendage,” he told us. Hearts sputtered that he was, of course, only a little Faun with much growing to do, and I laughed–probably quite loudly, although all the world for me was silent except those amazing words in that soft, gentle Scouse accent. Well. After the photos he gave Hearts a hug, presumably for her hard work sewing plush toys of his increasingly obscure roles (it’s good work and should be ongoing!) and then kissed her on the cheek. She reports she felt stubble, before lapsing into delighted catatonia. Above: the result of getting kissed on the cheek by Paul McGann. The little tricorner is from the plushie Redcoat checking up on his mother. While we were upstairs, I changed out of my Eighth Doctor cosplay (which I’d worn to get a theme going in my photo–upon reflection, it’s a pity that Hearts and Ellen didn’t do the same; Hearts would have made a lovely faun) and swept in my Lady Presidential gown back to the mall food court. The Egg Harbor cafe was open for brunch and had an excellent gluten free menu, so take note if you’re ever in the area in the future. There was a bit of a wait, though. We spent the time checking out the Yankee Candle shop, which is only worth mentioning because Hearts swears that their Treehouse Memories scent is exactly the smell of Paul McGann and/or his sweater. I tried to be cool about it, I swear I did. I’m sorry. 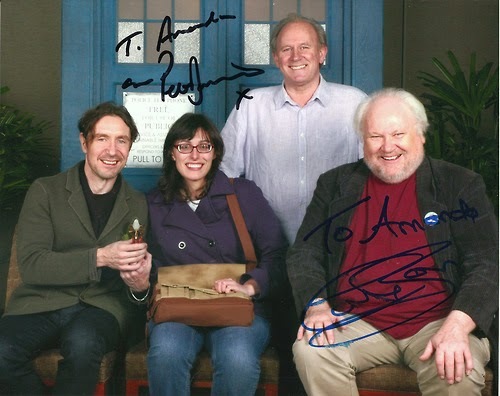 After lunch, we went back to queue for the queue–this time for autographs from all Three Doctors. We got to hang out with some other Clann McGann members. There was even a heartwarming moment when two people who had only known each other by icons online exchanged real names, then screen names, and discovered they were best friends all along. Unfortunately, this was followed by a nature documentary worthy stampede once the queue opened up. I swear I could hear Mark Strickson narrating our plight. In the Virtual Queue holding area, they had a life-size TARDIS to pose with. Both Plushie and I might be considered something less than life size. 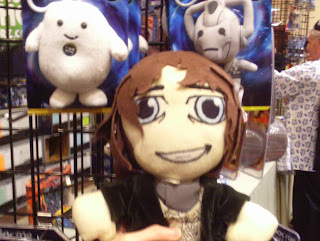 Also, a little ahead of us in the queue, I discovered this fellow Eight plushie. 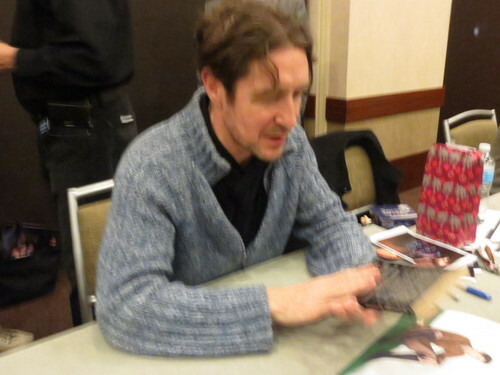 His creator gave him to Paul McGann when she got her autograph–I heard the Scouse-accented “Thank you!” across the room and spotted him lying on a chair besides Paul when I got up. I’m sure he’s going to a good home. The Three Doctors Autograph queue was long and arduous, the less said of it the better. 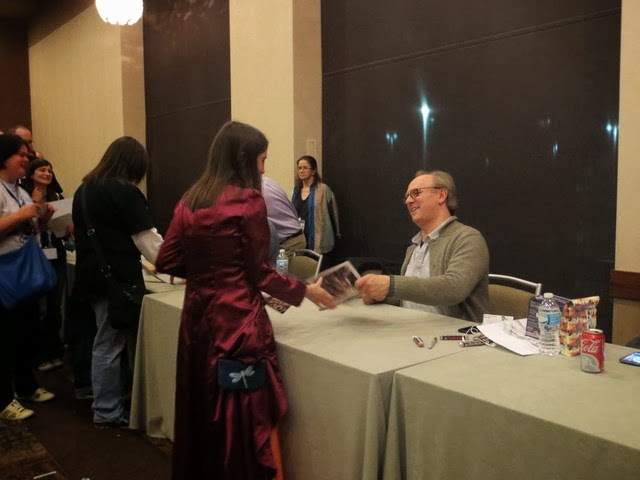 I did have some entertaining moments, especially when I realized I had my photo with Paul but nothing for Colin Baker and Peter Davison to sign except my con program, which I’d left up in the room. The benefit of being very far back in line was I had time to run up and fetch it. On my way back, I encountered two members of a wedding party happening on an upper floor. We exchanged best wishes on our respective festivities. Sometime I plan to put together a collage set of all the Doctor Who related autographs I’ve collected over the years. But really, I go for the autographs less for the sake of having a signature and more to get to meet actors and creators in person. Although the Doctors had it about as hard as us–waiting in line for 2 hours vs signing nonstop for 2 hours, I’m not sure which I’d rather endure–but were extremely pleasant and preternaturally gracious. Colin Baker was even generous enough to laugh weakly at my comment that “The Sixth Doctor is colorful in ways besides the obvious.” I’m truly sorry, Mr. Baker. Meanwhile, Hearts was beside me talking to Paul McGann, and Ellen was filming (somebody get this woman an Oscar statuette). The Clann McGann, like all asylums, is a democracy, but if that ever changes Hearts will become our monarch. She’d brought some chocolates and a card as a slightly-belated birthday gift. She also gave him a (watercolor? in any event beautifully drawn) picture of him as Percy Toplis in The Monocled Mutineer, one of his first and favorite roles. So she got glomped again, and no one deserved it more richly. Then from her bag of tricks she produced several more things. He was extremely excited to see a copy, as he hadn’t had his hands on one in years. He was so excited that he turned to show it to Colin Baker beside him–“Look at that young soldier boy” (this was 30 years ago, but he still looks eerily like Percy. I’m not sure what McGann is doing to keep from aging, although he’s such a sweetheart I suspect it has more to do with Time Lord magic than blood sacrifices a la Elisabeth Bathory). The rest of Hearts’ bag of tricks, culminating in a reference to a certain “naughty scene” from Nice Town (watch the series and find out; I’m not telling you) can be found here. Currently clinical tests are being run to see if daily viewing of that video defeats seasonal winter blahs. The subject of these tests is myself, and I suppose Plushie Eight is the supervising physician. –but until now I hadn’t realized quite how accurately I have been waking up to Paul McGann’s smile every morning the past year. Well, indeed, again. Oh, and either because he liked Plushie or he did remember me from Gally after all or perhaps because I was there in association with Hearts and her bag of wonders, he gave me a hug. And told me I was “nice and warm”. I was just angling for a handshake, as when that happened the first time my hands were cold and he wound up chafing warmth into them. Paul McGann’s mild obsession with regulating his fans’ body temperature is oddly endearing, although I don’t know if it’s the first sign of an oncoming British grandfather transformation or what. Anyway, as per usual, my expectations were proven wonderfully wrong. Peter Davison, after 2 solid hours of signing, was subdued but gracious. Like probably many other people in the line, I thanked him for the Five(ish) Doctors anniversary special. We piled in to friends car and drove around looking for food, decided against a few sports bars as we weren’t exactly dressed for it, and wound up at a Noodles and Company. They served wine, although when Ashli ordered a glass she had to take her blonde wig off to be carded. 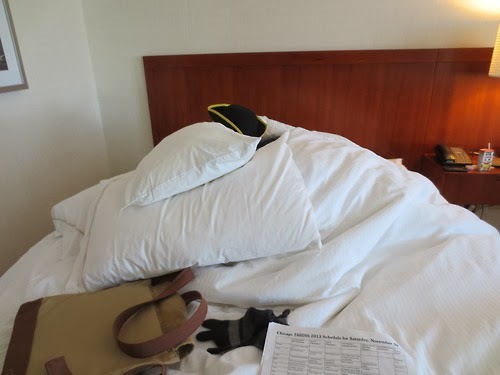 The unexpected perils of cosplay. A little girl at the restaurant asked me if we were in a play because we were so dressed up. Unsure how much she’d understand the concept of a convention–I don’t think I would have at her age–I said there was a big party going on at the hotel and we were in costume for it. Ashli’s boyfriend was dressed as Ainley Master, and he said Paul McGann complimented him on the excellent Renaissance-era costume. So Colin Baker might not recognize McGann in plush toy form, but McGann didn’t recognize Baker’s nemesis. It all evens out in the end. Speaking of Masters, the one hosting the Masquerade was excellent (Played by William Dezoma, who for some reason bore a resemblance to Tony Lee. Perhaps it was the beard. I did see Tony Lee out of costume going to pet a congoer’s dog and having a really friendly and down-to-earth chat, so I’m in his fan club anyway). Also, it seems like Freema Agyema was just down the hall from our room. Nothing really came of this information, except we saw her going in once and it was kind of cool. Sunday morning we didn’t have any queues to get up for, but we did sit down in the lobby by the elevators to people watch. This paid off as we saw lots of wonderful cosplays, including a fantastic Liz X who enchanted a little girl, and also some of the guests on their way to the brunch. 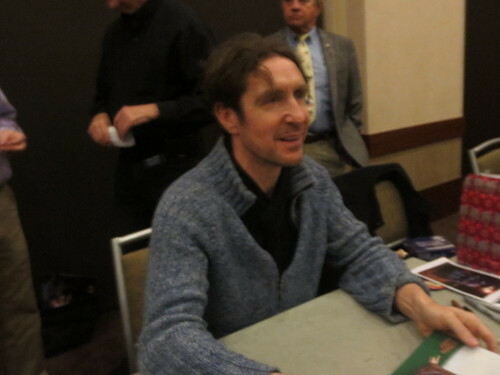 Paul McGann wandered towards the front doors instead until someone called him back. Early-morning dazed and confused, or trying to make a break for it? Who can say. 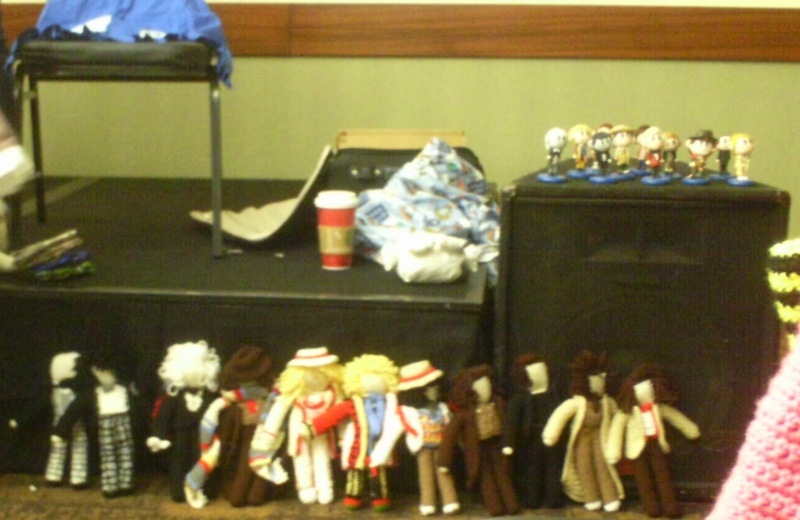 I went to the Crafty Whovians panel, where I was inspired. I really do want to either take up sculpey clay again or start knitting. If the latter, an accurate 4th Doctor scarf is probably too ambitious of a first project. Still inspiring. 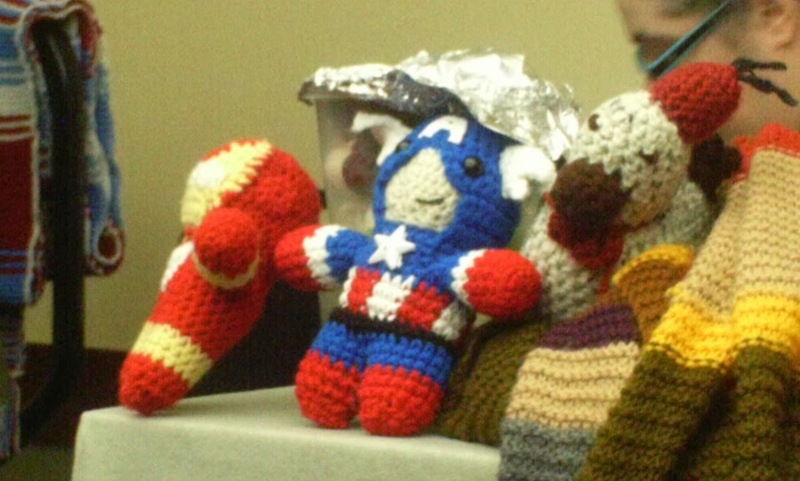 Captain America and Iron Man may not be Whovian, but they sure are cute! The 50th anniversary celebrations continued with a screening of The Five(ish) Doctors with commentary by Peter Davison, who was happily awake this time around. He was gracious even when exhausted but actually has a real sense of humor! And the shocking revelation of John Barrowman’s family was apparently his idea. Also, Colin Baker has a specially tailored copy of the Sixth Doctor’s coat that fits, shall we say, more comfortably than the original. Given how much he seems to enjoy loathing the thing (he told a baby Six cosplayer–a winner of the Masquerade, actually–that “you’re the only one who makes that look good”) this was rather amusing to me. One last time with Blum and Orman, I dropped into see the screening–if that’s the right word for an audio–of the first part of The I Job, which involves some alien monsters that first premiered in the Eighth Doctor Adventures novel Seeing I. They are a really endearing pair and I sort of envy them each other. Also, although audios are still a little unusual for my American media appetite, The I Job looks pretty fun–the tagline is Blake’s 7 meets Ocean’s 11 if that gives you an idea. The Classic Companion panel was adorable, because classic companions are all adorable. It’s some sort of hidden casting requirement, I think. Passing by the autograph room by the dealer’s room, I overheard one of the volunteers (a little recovered from Saturday) reflecting how lucky they were that everyone involved with the show was somehow magically nice. A good moment of fluffiness to end on, I think. I spent a little more time ‘lobbyconning’ before Mom arrived to drive me back home. She’s not quite converted to Whovianism, but I think she can at least see the appeal it has for me. She also seemed to completely understand when I wore my prom dress for the rest of the day. Actually, in closing, I just want to state for the record that Hearts really needs to open an Etsy shop. this really has to happen.